Texas Ceramic Artist Running a Collaborative Art Studio in San Angelo. 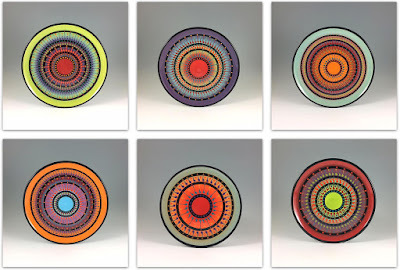 Knack for Wheel Thrown, Air Brushed Pottery Ready for Everyday Use. I've never agreed with the saying "Those who can, do; those who can't, teach," and in fact, I keep coming across examples of teachers that are better because they also make art themselves. Sometimes the art leads them to teaching, and for others, the teaching brings them to art, as is the case with Roger Allen of the Chicken Farm Art Center in San Angelo. He studied Art Education in college and taught for many years before shifting full time to his own art center. 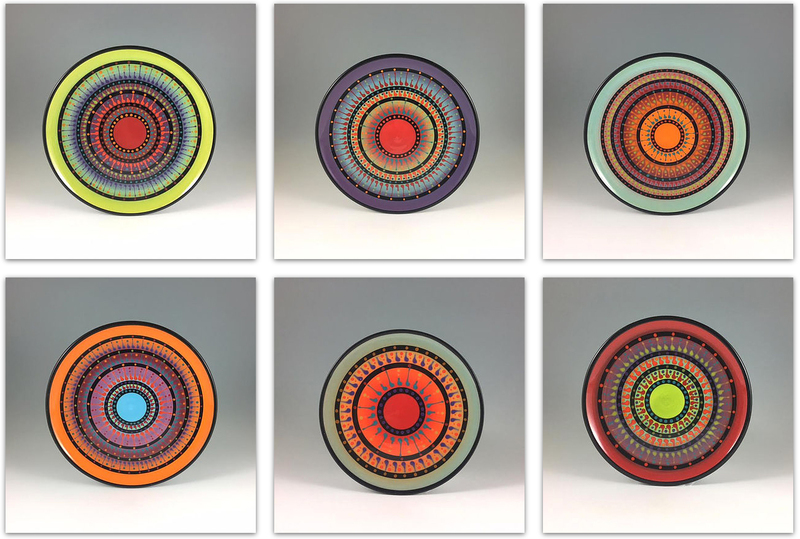 I first spotted Roger's work at Texas Clay Festival a few years back, and his vibrant color palette immediately drew me in. 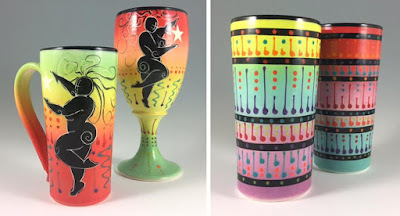 If you spend a lot of time around ceramic artists, you'll notice a common trend in glaze colors, lots of earth tones, maybe a few jewel tones, but very rarely do you see someone who plays with a whole rainbow of colors. Enter Roger Allen! His characteristic style makes use of the whole spectrum, beautifully blended with an airbrush glazing technique. This allows him to create gradients between shades that isn't possible through dipping or painting processes that most potters use. On top of this base coat, Roger then adds decorative motifs. He has several collections ranging from silhouetted dancers to more decorative patterns. Every piece is one-of-a-kind, but made to go together as an eclectic set. I could spend hours taking in all of his vibrance in his work! His passion shines through not only his work, but also his art center, where he now manages full scale production of his line with various other artists. The center is also a hub for pottery classes and studio space for artists of all ages to pursue their creative dreams. I can only imagine that a class at the Chicken Farm Art Center would be a colorful and informative event every potter should experience at least once in their life.